Norm Goldman, Editor of sketchandtravel.com is pleased to have as our guest, Genevieve Grant of Yukon Wild Marketing. Good day Genevieve and thank you for agreeing to participate in our interview. What is Yukon Wild Marketing and what is your role in the company? Hello Norm, thanks for having me. Well first, let me explain what yukonWILD is. yukonWILD is a consortium of 26 licensed independent wilderness tourism outfitters offering outdoor adventure trips in Canada's Yukon and surrounding areas. The consortium's goal is to provide adventurous travelers with a central source of information about the range of activities that are possible in the North. Marketing yukonWILD is one of the most exciting things I have ever done as a marketer! We work daily with some of the world's most seasoned outdoor adventure experts in one of the world's last wild, unruly and breathtakingly beautiful frontiers. Yukoner's are a different breed, living so far from the maddening crowds that one feels closer to the sky than they ever thought possible. My role in the company is to ignite interest and let the secret out, that the Yukon is a definite must do in your lifetime adventure trip. Whether it is dog mushing, canoing, hiking or just gazing at the Northern Lights, yukonWILD wants to invite the outside world into our world outside. Could you tell our readers where the Yukon is located and why is it an interesting place to visit? ***The midnight sun. The first summer I spent here, I lived in a tent the entire 4 months. I never once used a flashlight and could read with ease under the light of the midnight sun. The complete absence of darkness is one of the most exhilarating aspects of the Yukon summer. You will need much less sleep and your capacity for adventure just seems to expand. 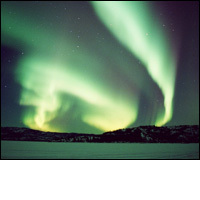 Of course, the winter days are short, but you need darkness to view the Northern Lights! ***The history. During the gold rush of 1898, Dawson City was the largest city north of San Francisco and a bustling, cosmopolitan centre. Gold fever brought the world to the Yukon and this spirit of adventure, fortune seeking, bravery, mystery and opportunity still has a stronghold on the hearts of Yukoner's and all who visit. ***The pristine natural beauty. I cannot explain with enough emotion what it is like to raft and drift past glaciers as old as time itself on crystal clear water, or see Northern Lights that seem so close you might catch yourself reaching out to touch them. Or to hear the shwish of your dog sled on the undisturbed snow as your own sled dog expert teaches you the ropes to guide a team of dogs on the trail of the infamous Yukon Quest. ***The Yukon is modern. We don't live in igloos. Whitehorse, our capital is a thriving, modern city with all of the amenities great cities have, including a world class arts center, a brand new recreational facility built to host the Canada Winter Games in 2007 and excellent music festivals, events, restaurants and shopping. How easy or difficult is it to travel to the Yukon and when is the best time to travel there? Whitehorse, the Yukon's capital is just a 2 ½ -hour flight from Vancouver, BC. There are direct flights from 3 major Canadian cities as well as Germany. 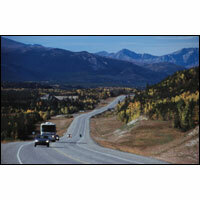 For those with more time, driving the Alaska Highway is one of the most breathtaking road-trips out there. I have heard The Dempster Highway, from just outside of Dawson City to Inuvik described as a religious experience with vista after vista to hold even the wildest imaginations captive. Would you recommend the Yukon as a place to honeymoon or to experience a romantic getaway? If so, why and if you had to choose six of the most romantic venues in the Yukon, which ones would you choose? ***Aurora borealis viewing at Frances Lake Wilderness Lodge. Imagine a cozy log cabin all to yourselves in the gorgeous winter wilderness with the northern lights dancing above. ***For those with a taste for the uncommon, take an Uncommon Journeys custom hike trip: Skim fields of alpine flowers aboard a helicopter as you and your loved one head into the yurt base-camp for a few days of alpine hiking, canoing pristine rivers and fly-fishing for lunch. Yurts are remarkable structures with Douglas fir lattice work, pine floors, circular skylights and large windows and come complete with a cozy wood stove to snuggle up for a warm and romantic evening. ***Have Shadow Lake Expeditions create the perfect date trip for you. Artists, photographers, bird-lovers or just quiet nature lovers are completely catered to whether their adventure is by raft, canoe, or on foot. ***Retrace the Gold Rush: Take a tour down the Yukon River in a comfortable covered Carolina Skiff River Boat, following the route taken by gold seekers during the gold rush in 1898. Cathers Adventures will treat you and your partner to a trip through time on one of Canada's most historic and beautiful transportation routes, The Yukon River. ***Live on your own island. SIR Country Ranch will drop you at Big Salmon Lake, which is so remote; it is accessible only by boat or floatplane. Rejuvenate your souls in a cozy cabin for relaxing days of fishing, sketching, hiking and rest assured that the only company you will have is each other - oh and Mother Nature of course! ***Visit the Nahanni River take the canoers trip of a lifetime with Nahanni River Expeditions as your expert guide for a life altering outdoor adventure on what is considered the Mecca for all canoe trippers. Could you tell our readers something about learning adventures in the Yukon? I understand there are experts who conduct adventure tours. As a follow up, could you also tell our readers about the nature tours? · Rookie Ranch where novice dog mushers learn how to handle a dog-sled, care and drive their own team of dogs, under the expert tutelage of a seasoned dog musher. · Due North Journeys: Learn first hand about critical habitat for many species of rare and endangered flowers, birds of prey and big game animals including, Dall sheep and North America's largest population of grizzly bears. Due North invites you to Experience the continual orchestration of life and how these species interact within their ecosystem. · Uncommon Journeys is the Yukon Branch of the Canadian Outward Bound School and as such they have been offering dogsledding, canoing and hiking courses and guided expeditions in the Yukon for over 10 years. Every trip they offer is based upon an experiential learning curriculum, where the focus is always Learning by doing. · National Outdoor Leadership School: This course develops competent outdoor educators in the mountains and on a range of rivers. Graduates can lead novices in the backcountry managing the risks of mountain and river travel and effectively teaching relevant technical and leadership skills. They are able to present appropriate information and attitudes using a variety of experiential techniques. · Frances Lake Wilderness Lodge: Embark on an educational excursion at Frances Lake, embedded between soft mountain ranges. It is the ideal site to learn how wildlife, plants and the land depend on one another. To explain these intricate relationships to interested people, a well-known local naturalist accompanies guests on this special excursion. 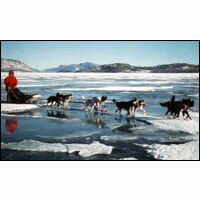 Starting with the First Nations people millennia ago and continuing through the mid-1900s, the combination of dog and sled made transportation and communication possible during the North's long winter season. Today, dogs aren't needed like they once were, but many Yukoners keep the mushing tradition alive and are eager to introduce the activity to adventurous visitors. There are dogmushing races yearly that generate crowds of spectators and there are hobby mushers who just love to get out there. Could you give our readers an idea of the cost of lodging and dining in the Yukon and some suggestions as to where one might find romantic dining establishments? As with any travel destination the Yukon offers an array of lodging and dining to fit any budget. For a romantic dinner in Whitehorse, I would suggest La Gourmandise, a new French Restaurant with exquisite décor and delectable French cuisine, or Giorgio's, a well-established and well-loved fine dining restaurant. Is there anything else you wish to add that we have not covered pertaining to the Yukon? For artists, the Yukon is truly a creative haven. The natural beauty provides inspiration and thus we have a tremendous amount of talent and support for our prolific arts scene.